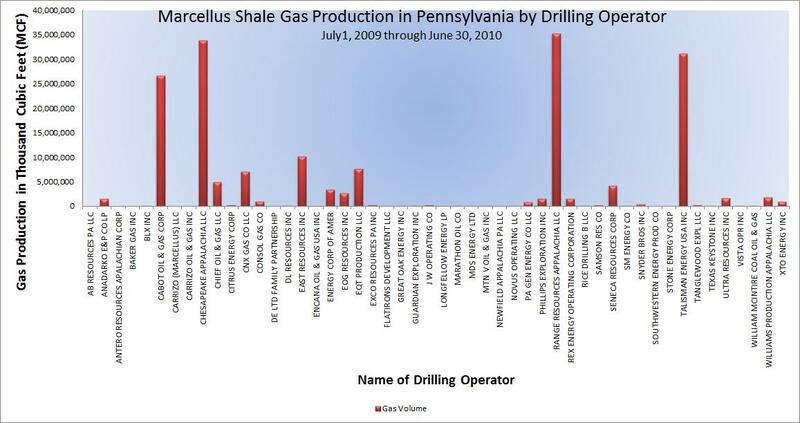 As of September 7th, 55 of 73 drilling companies that operate in the Marcellus Shale field in Pennsylvania have reported their production data, which has been compiled into a single Excel spreadsheet by the Pennsylvania Department of Environmental Protection (PA DEP). Click here to see the list. This dataset is quite raw, and far from complete. Even so, a review of the preliminary data is a worthwhile exercise, as it gives us some insight into the industry that we were unaware of before. Before getting into the specifics of production, a few overall numbers for the state would be appropriate. Altogether, there were 5,678 rows of data, representing 3,954 distinct wells. Only 3,076 of the rows have production data. Production refers not only to oil and gas, but to waste products, as well. The spreadsheet tracks production data in the following categories: Basic Sediment, Brine, Condensate, Drill Cuttings, Drilling, Frac Fluid, Gas, and Oil. It is not known whether the final release of the data, which is scheduled for November 2010, will have a greater or fewer number of categories. The data comes unsorted and without explanation, so the units of measure for all categories are not entirely certain at this time. The first category, Basic Sediment, is a solitary occurrence, and the volume of production is listed as 1,179. Whether this reported amount is miscategorized, irrelevant, or just exceedingly rare is not known at this time. The exact nature of what Basic Sediments refers to is not clear at this time, either. Eight hundred-one (801) of the reported Marcellus wells produced brine, with volumes ranging from 2 to 24,165. For the moment, there is no choice but to assume that all of this is reported in the same unit, which will be assumed to be gallons. To give an idea of distribution, some arbitrary comparisons have been made here as well: 149 of the 800 wells have brine production of 100 or less, and 12 of them have production of 10,000 or more. The total brine production reported statewide was 1,196,001.19. Condensate is presumed to be waste water from the process of removing gas that comes to the surface embedded in water, which must then be extracted in condensate tanks. Of all of the wells in the state, 124 reported on Condensate, but the vast majority of those came back with a volume of zero. There are eight wells that reported non-zero volumes, and those range from 18.08 to 113,096.34 for a total of 187,855.85 units. Drill Cuttings is the term used to describe the rocks and sediments that are removed in order to make the original well. There are ten items in this category, which range in value from 250 units to 8,527, for a statewide total of 15,594.07 units. The measure of unit is again unknown. The distinction between Drilling and Drill Cuttings is not clear at this time. Four hundred ninety-seven (497) wells reported production in this category, yielding between 0 and 27,200 units of product for a statewide total of 898117.53. As a point of comparison, 291 of the 497 wells produced 1,000 units or less, while 15 wells produced 10,000 units or more. Uncertainties about the unit of measure that were expressed in the Drill Cuttings section apply here, as well. The following category is Frac Fluid, which should refer to the chemical additives that make up one percent or less of the solution that is injected into the wells to release pockets of gas which are trapped in the shale deposits. According to this data, however, statewide production in this category exceeds the production of Brine, which is the term usually used to describe the salty waste water that comes up from the wells that would include the Frac Fluid as a small component. We must, therefore, question whether there might be some discrepancies in the way in which different companies report their data, or whether the results are due to a simple unit of measure issue. At any rate, there are 383 wells reporting Frac Fluid production statewide for a total of 1,621,721.19 units, with individual values ranging from 0 to 32,778. Of those 383 wells, 157 produced 1,000 units or less, while 54 produced 10,000 units or more, and gallons seems like the most likely unit of measure. There are 872 wells with production information for gas, of which 240 wells are reporting zero gas production. Of the remaining 632 wells, production values range from 29 to 2,841,152 units for a statewide total of 179,779,048. According to http://geology.com/usgs/marcellus-shale/, production at the wellhead level is commonly recorded in terms of thousands of cubic feet (MCF), which would put the reported production of the Marcellus Shale wells in the state at about 180 billion cubic feet (BCF) for the year. Of the 632 wells with non-zero values, 271 produced 100 million cubic feet (MMCF) or less, while 360 produced more than that amount. There is also oil production associated with the Marcellus Shale drilling operations, and values in this category have been recorded for 385 wells in the state. Only 155 of these wells have a production value other than zero, however. Values range from 10.76 to 20,741.66 units, which are presumed to be barrels, for a statewide total of 402,253.38 barrels. In addition to these categories, there are also 2,600 records that are included in the report but don’t have production data for any of the categories. These are distinct from items in the categories listed above with a listed production volume of zero. Credit should be given to the PA DEP for undertaking the project of mandating and publishing production reporting of the Marcellus Shale gas extraction industry in the state. Further credit should be given since this data was provided well ahead of the planned release date of November 1, 2010. And they should be praised for publicly listing companies that were not in compliance with the regulations that demand the production reporting in the first place (click here to see the list of 33 compliant and 40 non-compliant companies). But when you take the time to look at the data, the thing that stands out more than anything is that it is a disorganized mess. It is clearly incomplete; all forms of production are tossed into the same column, and no units of measure are provided for anything. Compare that with the records kept by Arkansas or Texas. A non-profit stakeholder group called STRONGER, State Review of Oil and Natural Gas Environmental Regulations, Inc., recently assessed the quality of the Pennsylvania’s hydraulic fracturing oversight program and presented the results in a report. In this report, STRONGER praised the strength of the PA DEP’s waste identification tracking and reporting process – In other states, production data are being tracked more extensively, but waste data are limited at best. Along those same lines, legislation is being proposed that will require more extensive reporting obligations on the part of well operators. >condensate is a term for oil but a certain type of oil associated with natural gas. It is typically very light or low-viscosity and can be chemically thought of as gasoline. Some condensates used to be used to run tractors on farms. It is high in lighter components like benzene, toluene, etc. and thus is worth a bit of money. Gas that is associated with condensate or natural gas liquids (NGLs) is called wet. Dry gas is almost 100% methane and has little NGLs associated with it. >You are right about condensate…there are several more up to date blogs that discuss that. >Conensate is *not* waste water. Think of it as natural gas liquids. "According to this data, however, statewide production in this category exceeds the production of Brine, which is the term usually used to describe the salty waste water that comes up from the wells that would include the Frac Fluid as a small component. " No. A bit more science education and reading could clarify your issues. Shale Gas doesn't occur in "pockets". I wish you all the best but PLEASE… learn before you speculate.